Web-Scale Simplicity for Secondary Data - One platform for backup, files, objects, test/dev, and analytics. Cohesity provides the only hyperconverged platform designed to eliminate secondary storage silos. It takes aim at the inefficient, fractured landscape of secondary storage for backup, development, files, objects, test/dev copies and analytics by applying a distributed, web-scale architecture to converge these silos of data. 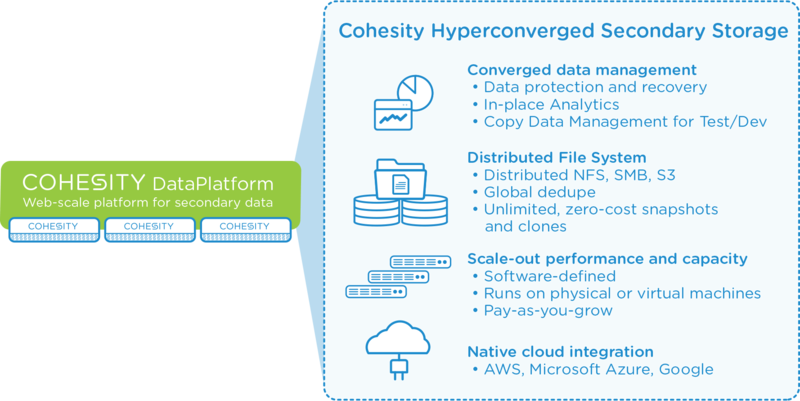 The power of the Cohesity platform derives from combining distributed storage, scale-out compute, native cloud integration, and converged data management in one simple unified solution. Eliminate secondary storage silos and consolidate backups, files, objects, test/dev, and analytics data.